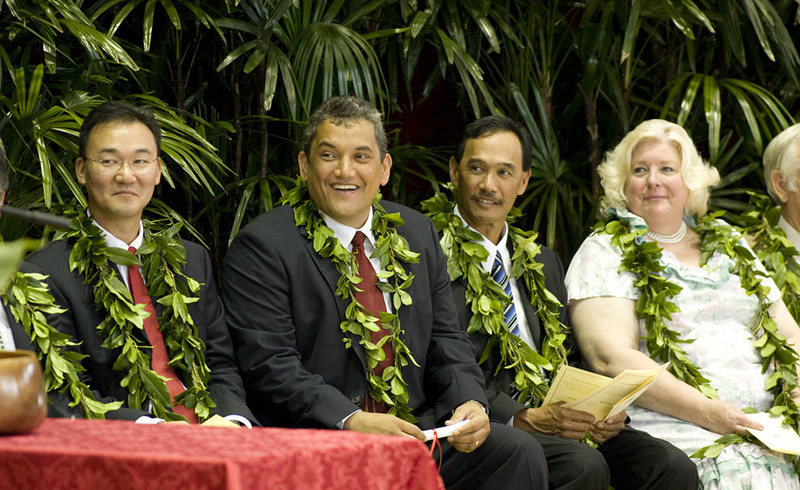 Councilman J. Yoshimoto, Mayor Billy Kenoi, Councilman Guy Enriques, Councilwoman Brenda Ford during inauguration ceremonies. Billy Kenoi, center, recites the oath of office from Judge Ronald Ibarra, left, as Council Chair J. Yoshimoto watches during inaugural ceremonies at Afook-Chinen Civic Auditorium. A member of the audience gets a snapshot of the Hawaii County Council taking the oath of office during inaugural ceremonies in Afook-Chinen Civic Auditorium. Lunch provided after inaugural ceremonies. HILO — Mayor Billy Kenoi used his inaugural speech to promise a hiring freeze for county government, an efficient and reliable bus transit system and a new system to track requests and applications. 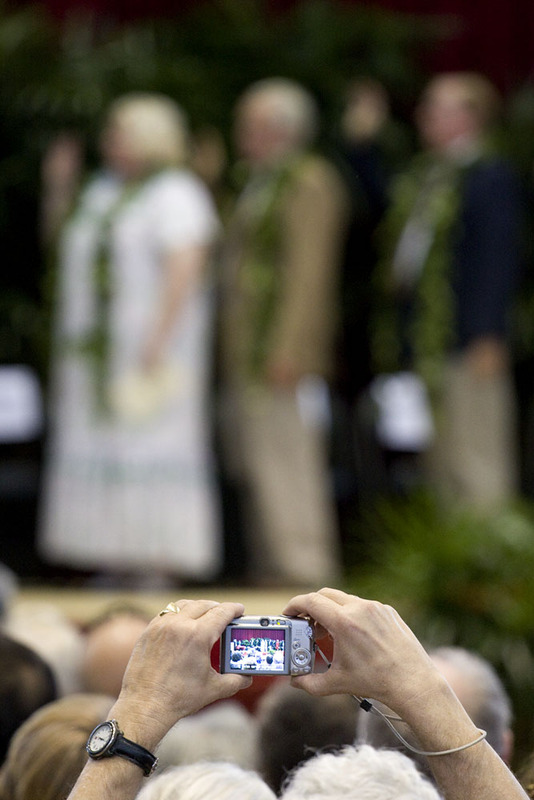 A crowd of hundreds gathered Monday in Afook-Chinen Civic Stadium to watch as Kenoi, the nine-member county council and prosecuting attorney were sworn in. 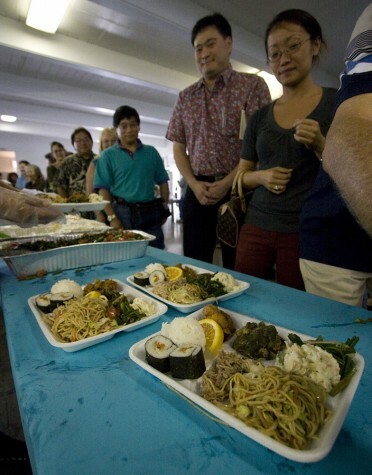 Kenoi’s speech included many of the topics that were hot button issues for previous administrations and the nearly year-long mayoral campaign. Kenoi said he wants to connect all the communities across the island with their county government and keep the lines of communication open. Kenoi noted the county is headed for a time of increasing unemployment, slow job growth, declining revenues and likely a slow recovery from the economic slump. He said he will work with state legislators to maximize the positive impact of available resources. 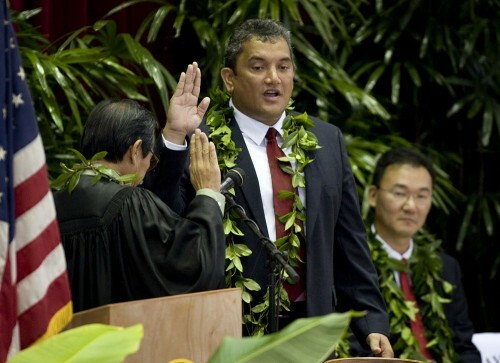 Near the top of his speech, Kenoi mentioned a hiring freeze for county government as a fiscally responsible move. As he had repeatedly stressed during the campaign, the island would greatly benefit from a safe, efficient and reliable bus transit system. He did not mention how he intends to pay for it during his speech. Kenoi also called for a tracking system for county applications and requests. Another of his campaign bullet points, such a system would allow applicants to monitor where their paperwork is, whose desk it is on and when a decision should be made. Such a system would speed up permit applications and make departments and workers more accountable, Kenoi said. Although there may be less money, Kenoi said some issues cannot be pushed aside, including finding a solution to the island’s rapidly piling up solid waste problem and straightening out infrastructure. The new mayor, an attorney and former executive assistant in Mayor Harry Kim’s adminstration, thanked his family and supporters, and recognized the responsibility Big Island voters gave him last month. “I will be here every single day to honor that faith and honor that trust,” he said. Kenoi will serve for four years. The Big Island mayor’s office is non-partisan. Mayor Harry Kim, who was not in attendance, has said he plans to retire. Kim has suffered at least two heart attacks in recent years. In addition to his eight years as mayor, Kim served the Big Island as its Civil Defense Administration chief for more than two decades, and also as a teacher and youth coach. His students included Billy Kenoi, the man who succeeds him in the county’s top spot. J. Yoshimoto, of Hilo, took over as council chairman, echoing Kenoi’s economic restraint and called for government efficiency. “We need to find ways to do more with less,” he said, adding he intends to return to the general fund some funding that already has been allotted to the council. Also returning to the council are: Donald Ikeda of Hilo, Dominic Yagong of Hamakua, Pete Hoffmann of Kohala, Brenda Ford of Kona and Emily Naeole of Ka’u. New to the council this term are: Dennis Onishi of Hilo, Guy Enriques of Ka’u and Kelly Greenwell of Kona. Jay Kimura continues as the county prosecutor. I really need a better camera! Nice pictures! Hey Damon, was good to meet you there. And yup, I agree with your post on your blog, you had your hands full as ceremonies aren’t as exciting as Saturday morning cartoons for a little kid. Aloha Baron! Great blog…wonderful be able to get the latest on local political events…and great photo’s! I think all of you local bloggers, such as Aaron Stene are providing a very valuable and needed service. Thank you!